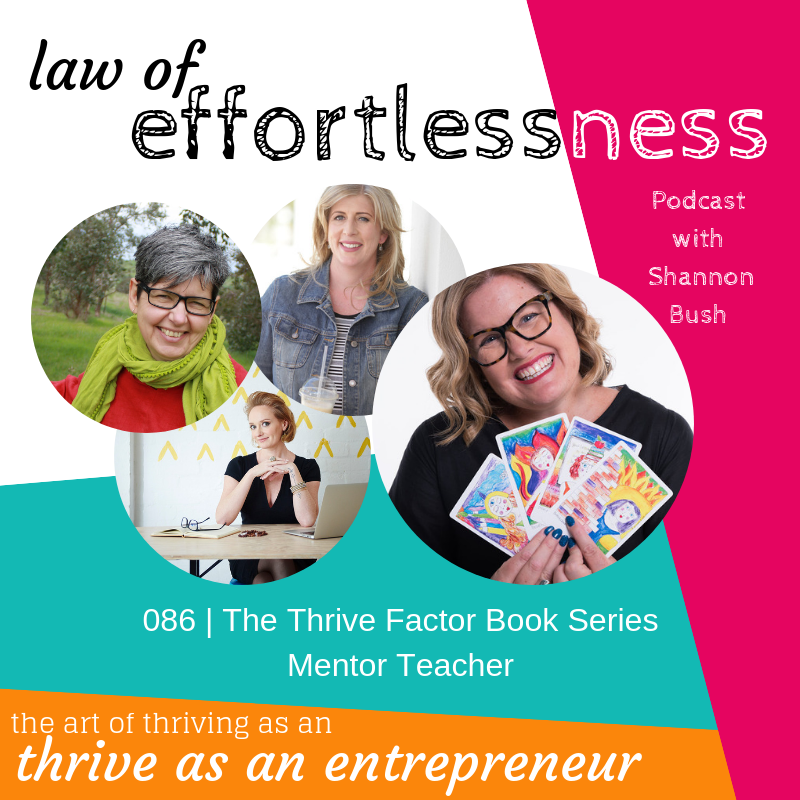 Welcome to the Law of Effortlessness Podcast with Amazon-Best-Selling Author and #businessyoda, Shannon Bush! Today Shannon introduces you to the Mentor Teacher Thrive Factor Archetypes, strap in because Mentor Teachers have a to to say and so this episode is longer than usual! Mentor Teachers are here on this earth to Mentor, and Teach and not just in the realms of gaining qualifications. They are always on the lookout for new things to learn in books, courses, podcasts. They are the researchers of the world and pride themselves on what they know. She has moments of being a smarty-pants, can be a bit of a know-it-all, and is incredibly wise. Often, the Mentor Teacher especially as a young woman or girl has interactions with people older than her who indicate she shouldn’t know something yet, or she is too young to know anything causing her to doubt her own knowledge and wisdom. Shannon is joined today by three incredible Mentor Teachers, Dr. Ricci Jane Adams, Julie Gibbons and Sarah Thomson. Dr. Ricci Jane Adama is the founder and Principal of the Institute of Intuitive Intelligence (you can find her on pages 136 and 137 of The Thrive Factor Book). Dr. Ricci Jane first met her Archetypes two years ago, describing it as a very powerful, pivotal moment for her, meeting the Liberator Engineer, Inspirer Believer, Shapeshifter Alchemist and of course, the Mentor Teacher. Ricci shares her vision of bringing regulation to the word of Intuitive Services in the same way regulations guide Universities and schools, and meeting her Mentor Teacher gave her permission to bring her vision together, and manifest it in the real world. Branding Mentor Julie Gibbons can be found on her website and Facebook. Marketing Expert Sarah Thomson can be found on her website here. This entry was posted in Business Wisdom, Effortless Success, LOE Podcast, Personal Leadership and tagged Amazon Best Selling Author, Author, branding, effortless success, effortless success zone, entrepreneur, intuition, LOE podcast, Magnetism, marketing, Mentor Teacher, Mindset, money, Perth, Perth Business Coach, Perth Marketing Coach, podcast, Psychology, The Thrive Factor Book, Thrive Factor Archetype on March 29, 2019 by Ashleigh Rae. Welcome to The Thrive Factor Book Series, today it’s all about the Mediator Diplomat Thrive Factor Archetype. This lady is all about balance and will find herself often caught in the middle of a lot of things and as much as she wants to share and help people, when her advice isn’t followed it can get frustrating. One of the greatest gifts of the Mediator Diplomat that’s often overlooked and undervalued, is that she is an amazing listener that makes those she interacts with not only feel listened too, but also heard. She’s able to see all sides of the whole and all the moving parts, which means she’s able to present different view points that doesn’t always sit well with others. Boundaries are so important for this lady, and more often than not the Mediator Diplomat tends to be a perfectionist, so please, be kind to yourself and put things out there even when they aren’t quite right. Join Shannon for a wonderful discussion with three Mediator Diplomats, Shalini Nandan, Nat Wright and Adwoa Abban. First up, is Shalini Nandan (featured in The Thrive Factor Book) from Legally Shalini, supporting and educating women to run responsible businesses with the right legal foundations in place. Shalini talks about the experience o embracing her archetypes from having one idea, and then recognizing that perhaps her initial perceptions needed adjusting. Shalini’s favourite super-power is her ability to listen carefully and allowing a resolution to unfold rather than pushing through and allowing solutions to present themselves. Keep listening to hear from Nat Wright who you’ve heard previously on episode 058 of the Law of Effortlessness Podcast. Nat is the owner of Verissima Natural Skin Care, where she hand crafts all natural, beautiful skin care products toxin free. Nat discovered her archetypes in a profiling session with Shannon where she found herself nodding along, and feeling a big YES! Over time, Nat’s learned to rein in her Inspirer Believer, and to balance the Mediator Diplomat with her Mentor Teacher archetype. Nat utilizes her archetypes to be an advocate for natural, toxin free beauty products as the Mediator Diplomat and Mentor Teacher compliment each other for Nat to educate and advocate her customers. Nat reveals that she’s been challenged by infinitely high standards that hold her back for not ever having her work feeling good enough and how she’s balanced it by learning to be proud of her work and all she’s achieved, and to celebrate them. Adwoa first met her archetypes two years ago and describes it as a confirmation of her identity, and how she is in the world. Adwoa is also an Inspirer Believer, Mentor Teacher and Shapeshifter Alchemist. Adwoa shares what she’s learned from being a Mediator Diplomat, particularly with shifting her perspective to walk in someone else’s shoes and see what life is like from another’s perspective, and requiring others to meet her halfway. Adwoa also shares the challenges she faces with having high expectations and standards, often pushing herself further without stopping, and self-doubt. This entry was posted in Business Wisdom, Effortless Success, LOE Podcast, Personal Leadership and tagged Author, Business Coach Perth, business success, effortless success zone, entrepreneur, law of effortlessness, marketing coach perth, Mediator Diplomat, podcast, The Thrive Factor Book, Thrive Factor Archetypes, Thrive Factor Book, Thriving Entrepreneur on March 25, 2019 by Ashleigh Rae. Chenae shares how everything for her began to shift when presenting in Tuscany, Italy in 2018 where she met Shannon. Chenae describes how she went from supporting women solopreneurs with Facebook Marketing to exploring fearlessness and “Tall Poppy Syndrome” and being open to the intuitive evolution that there was something more for her out there, and exploring what that just might be. Chenae shares how taking up an in-person archetype debrief opened up her understanding of being a Networker Connector. You’ll also hear Chenae chat about how her archetypes are showing up in a time of deep transformation for her personally and in her business including how she’s decided to run in-person workshops that serve her business and not just her need to spend time with others in person – and, how they intertwine closely with her other archetypes. Stay tuned to hear a little introduction to the Queen Ruler as Shannon and Chenae explore who this leading archetype is and enjoying the opulence and luxury she brings. Shannon brings you this interview to open up the possibility of what working with your own Thrive Factor Archetypes can look like when applied to your business and today, you’ll hear Chenae talk about the big changes and small she’s made as a result of the intuitive evolution that embracing her own Archetypes of the Inspirer Believer, Liberator Engineer, Heroine Adventurer, Networker Connector and a fifth, although not the most dominant, Queen Ruler. 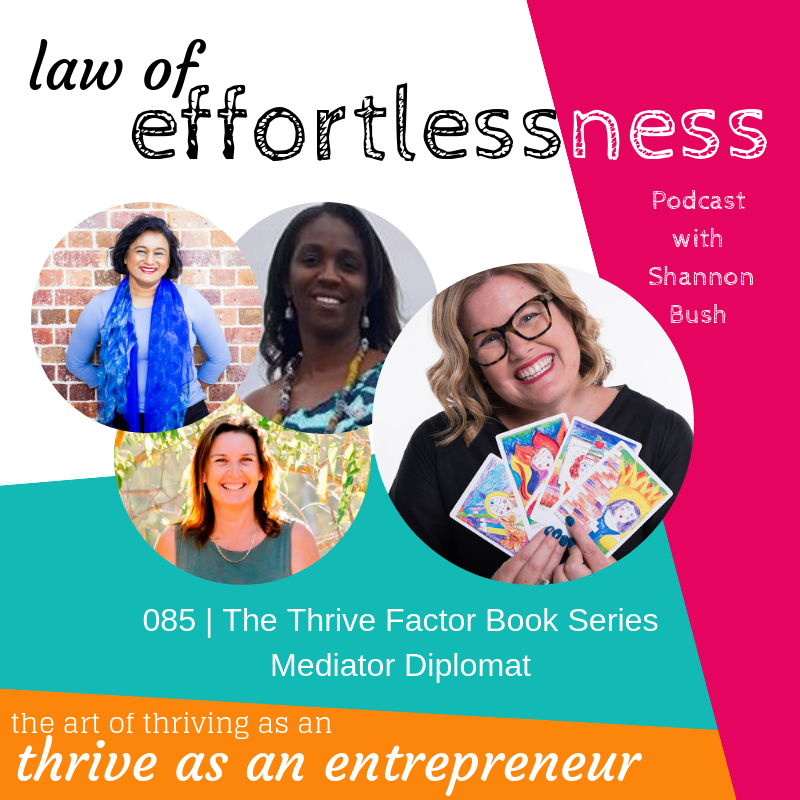 Welcome to another installment of the Thrive Factor Book series, with #businessyoda and two-time Amazon best-selling author Shannon Bush and her guest, Chenae Carey from Chenae Carey Coaching. This entry was posted in Business Success, Business Wisdom, Creativity, Effortless Success, LOE Podcast, Personal Leadership and tagged Author, Business, Business Coach, Creative Possibility, effortless success, effortless success zone, entrepreneur, growth, Heroine Adventurer, inspirer believer, law of effortlessness, Law Of Effortlessness Podcast, Liberator Engineer, Marketing Coach, Network Connector, Perth, podcast, Queen Ruler, The Thrive Factor Book, Thrive Factor Archetypes on March 7, 2019 by Ashleigh Rae. 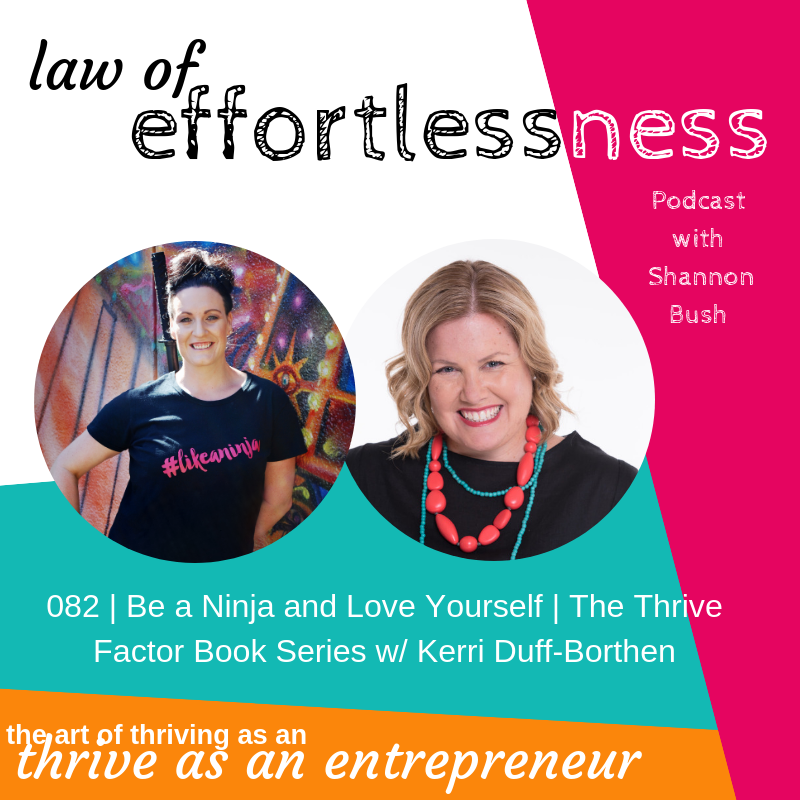 Welcome to Episode 082 of the Law of Effortlessness Podcast with your #businessyoda host, Shannon Bush! Today Shannon is joined by Kerri Duff-Borthen from The Shortlister, a recruitment platform for business owners across Australia. Kerri met her Thrive Factor Archetypes back in 2017, as a Pioneer Seeker, Visionary Creator, Inspirer Believer, Mediator Diplomat, and a sneaky Heroine Adventurer that kept poking and prodding her way to be seen and heard. Kerri spent two years getting to know each one individually and embracing them wholeheartedly. She identifies mostly as the Pioneer Seeker and Inspirer Believer but sees how they each blend together and make up the whole of who she is (see page 205 of The Thrive Factor Book). Kerri shares how she previously ran a more traditional recruitment agency called Duff Recruitment but found it was ‘eating her soul’ – it was then that she met Shannon and was profiled with her archetypes and began to embrace and utilize her archetypes including the Mediator Diplomat who supported her to create a process that supported both the employer and candidate beautifully through the recruitment process, and using the Visionary Creator and Pioneer Seeker to disrupt the market and pioneer a new way forward in her industry. Embracing these parts of herself had led Kerry to great success including recognition in the form of awards for her work. But, like all archetypes there are challenges – Kerri shares how she has learned to identify when she’s out of balance, and that her biggest challenge is being hard on herself – and on the flip side, how she brings herself back into alignment when she’s having a ‘dumpy’ day. This entry was posted in Business Success, Business Wisdom, Effortless Success, LOE Podcast, Magnetic Marketing, Personal Leadership and tagged #businessyoda, Business, Business Coach, Business Coach Perth, effortless, effortless success zone, entrepreneur, Law Of Effortlessness Podcast, LOE, magnetic marketing, marketing, Marketing Coach, marketing coach perth, podcast, The Thrive Factor Book on February 18, 2019 by Ashleigh Rae. 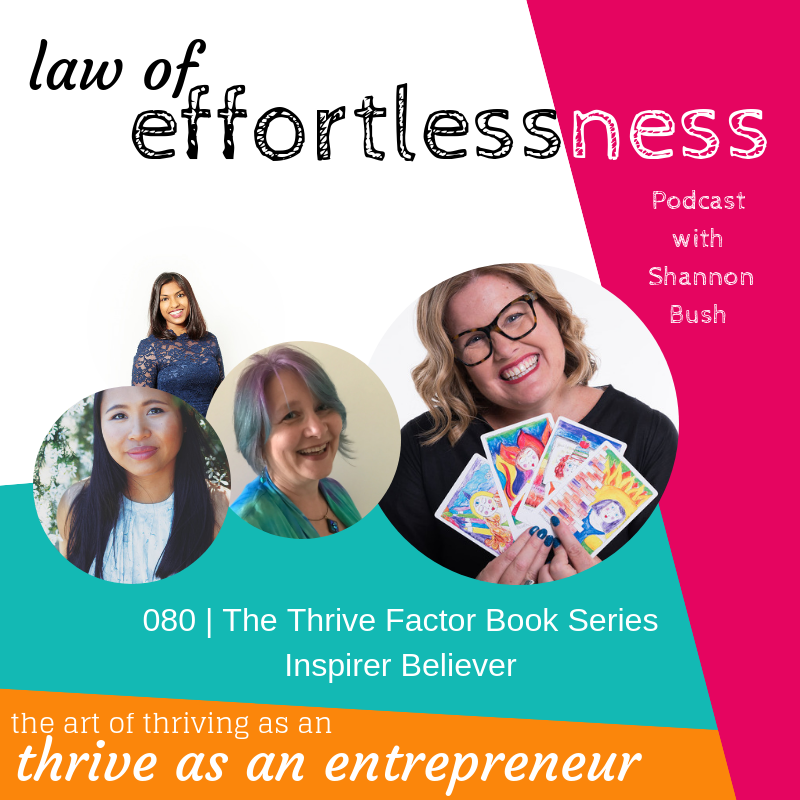 Welcome to episode 080, and the third Archetype the Inspirer Believer with your #businessyoda and now Amazon #1 Bestselling Author for the second time with a solo book – The Thrive Factor, Shannon Bush! The Thrive Factor features 12 personal leadership Archetypes for women in business. Today we meet the Inspirer Believer, you know her as the cheerleader and champion of optimism. She throws herself into things she is passionate about but can become burned out quickly. Her greatest lesson is to be inspired by herself and to share that with the world. Join Shannon as she chats with three very real Inspirer Believers – Sheryl, Kimberly and Pavitra. You’ll hear how Kimberlie has been inspired many times and is now onto her fifth business iteration which began with Tai Chi and is now in textiles. Kimberlie shares how one of her greatest joys with this archetype, is championing and cheerleading her mentees in her work, and being able to see the potential in others. On the flip side, you’ll also hear the challenges she faced in not being able to take off her rose-coloured glasses. Stay tuned to hear from Transition Mentor, Pavitra who describes the transformation and clarity that discovering her archetypes as overly joyous, and how she has fully embraced this aspect of herself to believe in the unknown more than what is known and in surrendering to the flow of life and creating from there. Pavitra also shares her challenges – acknowledging how easy it is for her to be inspired and to inspire others, and not having healthy boundaries to support it. Pavitra also shares how she is challenged by the logical mind trying to fathom many of the qualities, ideas and creativity of the Inspirer Believer as they are so intangible. Keep listening to hear from Graphic Designer Sheryl Young, who shares the joy of being so excited in the beginning of new projects, and the challenge of that huge amount of energy burning up so quickly and burning out fast. Sheryl also shares how she’s embraced a side of herself to cheer on her clients and using it to grow her own confidence and having permission to be authentic to herself. 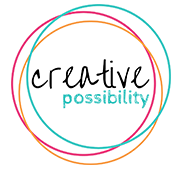 Email thrive@creativepossibility.com.au with your comments, questions and episode suggestions! This entry was posted in Business Wisdom, Creativity, LOE Podcast, Magnetic Marketing, Mindset, Personal Leadership and tagged archetypes, Author, Business, Business Archetypes, business coaching for women, Coach, effortless success zone, entrepreneur, inspirer believer, LOE podcast, magnetic marketing, Magnetism archetypes, marketing, Marketing archetypes, Mentor, Mindset archetypes, Money archetypes, Personal Leadership Archetypes, Perth, podcast, The Thrive Factor, The Thrive Factor Book, Thrive Factor Archetypes on February 6, 2019 by Ashleigh Rae. 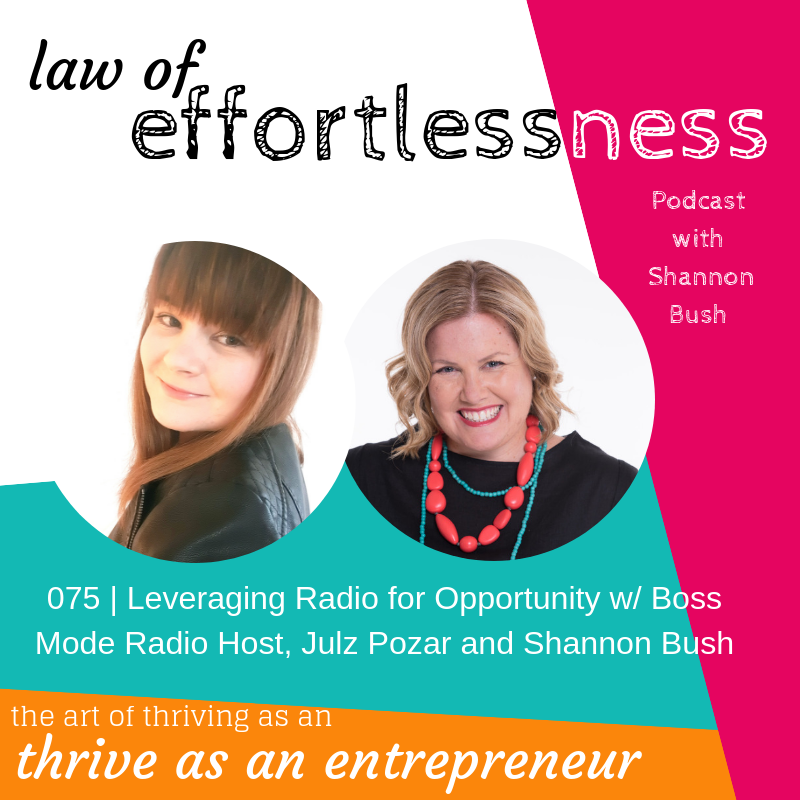 Welcome to episode 075 of Law of Effortlessness Podcast with your host, #businessyoda and marketing coach, Shannon Bush! Today, Shannon is joined on the show by Marketing for the Bizy Lady Boss Mode Radio Host, Julz Pozar! Julz is a Perth based Radio Show Host and Brand Marketing Strategist and she supports bizy-ladies with creative, easy to do branding and marketing that is DIY friendly. Shannon and Julz recount how Julz got her start in business with a Perth-based events enterprise seizing the opportunity to specialize in marriage proposals – and the challenges she faced in scaling, overwhelm, and navigating common pitfalls of entrepreneurship. Listen for an in-depth conversation on how Julz narrowed down and nailed her niche. You’ll also hear Shannon and Julz discuss the common mistakes and pitfalls business owners make in their branding. You’ll also hear Shannon and Julz share their perspectives on what separates a good guest from a great guest, and when guests miss the huge opportunity to leverage being on a radio show or podcast. As always, packed with practical actions and tips to make your business effortless! This entry was posted in Business Success, Business Wisdom, Effortless Success, LOE Podcast, Marketing and tagged branding, Business Coach Perth, entrepreneur, LOE podcast, magnetic marketing, marketing, marketing coach perth, Perth, podcast, radio podcast show, Thriving Entrepreneur on January 18, 2019 by Ashleigh Rae. Ever wondered how blogging, podcasting or video content work as a successful business strategy? 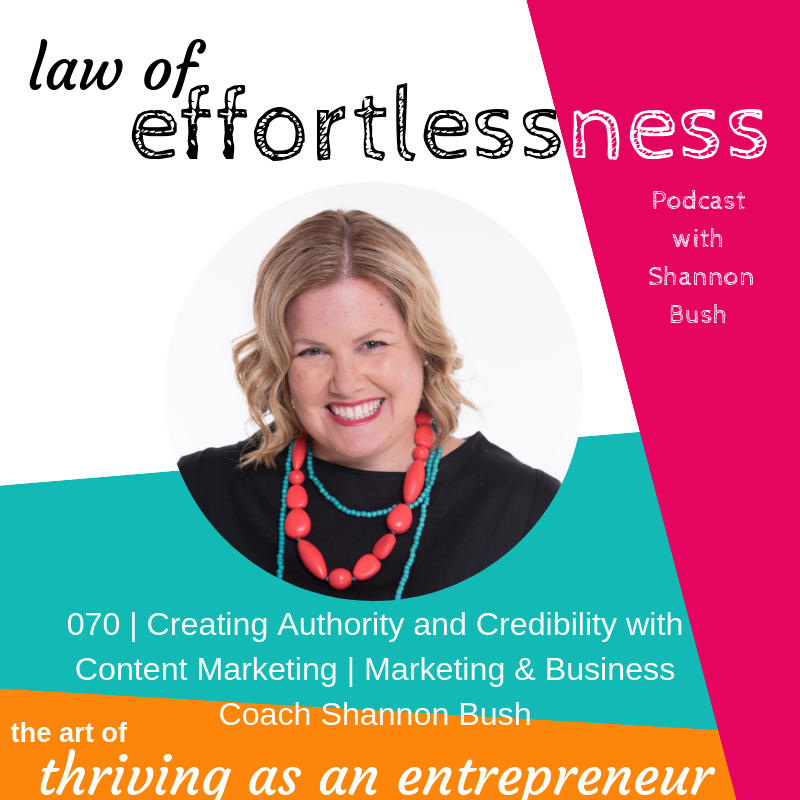 Welcome to a very special, celebratory episode number 70 of Law of Effortlessness Podcast with your Marketing and Business Coach, Shannon Bush! Join Shannon in celebrating two years of the Law of Effortlessness Podcast as she reflects on the incredible women who have been part of the Podcast on live coaching calls or experts sharing their knowledge and wisdom with you, the amazing audience who make LOE the fantastic podcast that it is! Celebrations aside, this episode is also rich in content and marketing insights! Have you ever wondered how other businesses seem to get their content marketing so right, and how you could replicate that success to improve your business results? Shannon shares her thought leadership on Content Marketing as a way of establishing your credibility and authority –sharing her formula for using content to create credibility and authority by demonstrating expertise and utilising strategic distribution. This episode is packed with practical, expert wisdom derived from Shannon’s work with many different types of business over many years from considering the kinds of images used and what they communicate on a conscious and unconscious level, to ensuring that the content you’re creating is as effortless as possible. Shannon shares her top five tips for choosing a content medium, and breaks down how a content marketing funnel can work smarter, not harder for your business complete with actionable ideas for content repurposing, and a reminder that nothing beats consistency! Find out more about Market To Thrive here. This entry was posted in LOE Podcast, Magnetic Marketing, Marketing, Small Business and tagged Authority, Business, Business Coach, Business Coach Perth, content marketing, Credibility, entrepreneur, Law Of Effortlessness Podcast, marketing, Marketing Coach, marketing coach perth, marketing strategy, online marketing strategy, Thought Leader on October 26, 2018 by Ashleigh Rae. 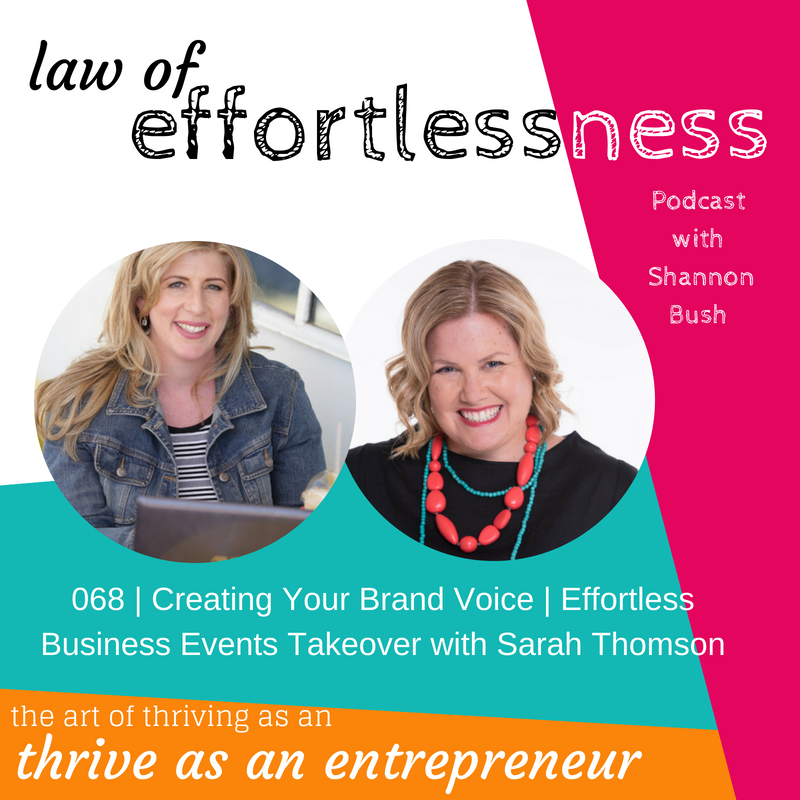 Shannon and Sarah are back with another installment of Effortless Business Events take-over of the LOE Podcast, talking on this episode all about your brand voice. Shannon and Sarah reassure us that we do not have to be singers in our business, to have a consistent and authentic brand voice – but we do need to be aware of what it is, as part of our branding identity. Sarah offers a great example of how tone and voice changes depending on the audience with her academic writing, compared to her less formal, business blogs and presentations – taking into consideration the expectations of the audience, and the goal of the communication. Shannon and Sarah also discuss how our personal brand voice changes when we talk to colleagues, children, and how our brand voice is a reflection of who we are at our most authentic, in slightly different iterations. Is it time for a Branding Health Check? Shannon shares how this also applies to employees in your business, or if you have anyone who represents your business in any way and how applying guidelines and boundaries will assist your employees (virtual or otherwise) to ensure that your brand voice is consistent, genuine and authentic. As always, Shannon and Sarah share their best simple, effortless and practical tips to support your brand voice is consistent, genuine and authentic by asking your target market for their input (and who not to ask for feedback) and knowing what impact you want to have with your brand. This entry was posted in Business Success, Business Wisdom, LOE Podcast, Magnetic Marketing, Marketing and tagged Authenticity, branding, Business, Business Coach, Business Coach Perth, Consistentcy, content marketing, Creative Possibility, Effortless Business Events, entrepreneur, Law Of Effortlessness Podcast, marketing, Marketing Coach, Perth, podcast, Sarah Thomson, thriving, WA on September 4, 2018 by Ashleigh Rae. Proud To Be A Certified Copywriter! Did You Know I’m A Certified Copywriter?